Do you like grapes? I adore it, but there is one thing, driving me crazy while eating grapes – those little seeds inside, which I sometimes crunch or directly swallow. To be honest, I am not entirely happy with their slightly bitter taste. But in the course of time, I have learned about the fantastic grape seed oil skin benefits! Have you heard of linoleic acid? If not, it is time to get informed about it! Why you will ask. Because it is an essential fatty acid and that the human body cannot synthesize it from other food elements. 1. What other valuable components grapeseed oil have? 2. What are grapeseed oil benefits for skin? 3. How to use grape seed oil? By the way, did you know that the most valuable element in grapes is namely the grape seed! From that point of view, it’s not a good idea to remove seeds, while eating grapes! And those, crunched by you are most efficient from a health perspective! I’ve already mentioned linoleic acid – it’s worth saying a few more words about it, as it should have a separate central chapter if you were reading a book about the grape seed. Another critical component is vitamin E – a victorious “warrior” against free radicals. Although stressing on those two compounds, there is much more of them, like micro and macro elements, proteins, provitamin A, vitamin C an B. All this combined is a natural treasure, which you shouldn’t miss! Let’s see why, in the next topic. 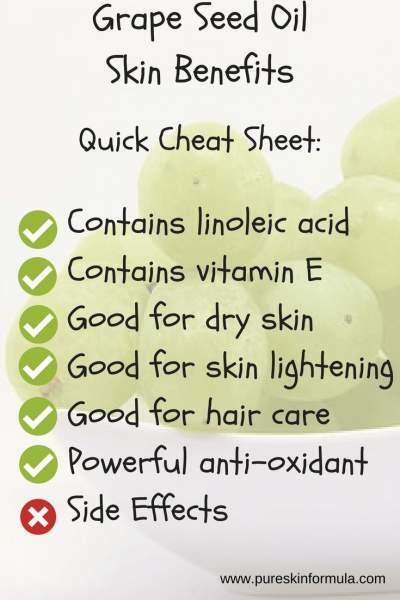 What are grape seed oil benefits for skin? It is one of the most potent natural anti-oxidants! It has antibacterial, anticancer, anti-aging, antiviral, anti-inflammation, immune system boosting properties! Do you need more proof? Here it is! 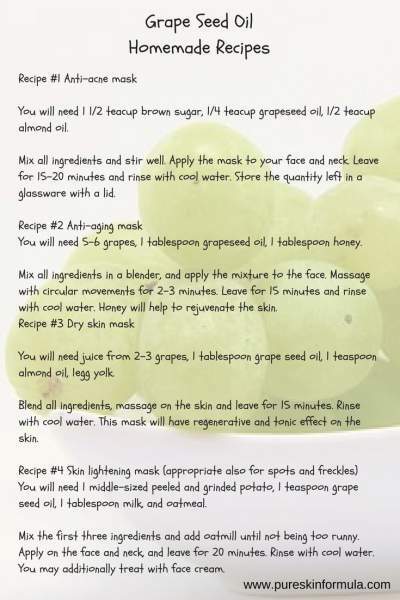 Grapeseed oil is used in many natural cosmetic formulas, like nourishing, hydrating creams, liquid and bar soaps, masks for sensitive and dry skin, face wrinkles, skin lightening, etc. Grapeseed oil improves the structure of the skin and makes it smooth. It regulates the function of sebaceous glands and prevents oily skin. It tightens, but doesn’t close the pores! You could blend it with essential oils, like avocado oil, almond oil, jojoba oil, etc. You can treat small cuts or skin burns. When you apply it on your face, you could do it either non-blended or blended with essential oils. I will give you a unique and quick solution if you don’t have grapeseed oil at home. 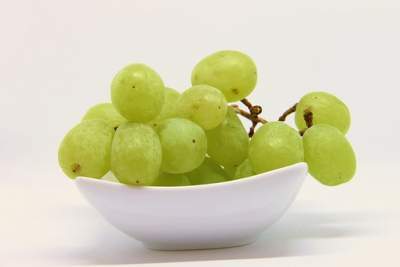 Smash small grape cluster and mix it with 1 tablespoon honey. Apply it on your face, and leave it for 20 minutes. Rinse with fresh water and add a face cream. Is grapeseed oil good for dry skin? Yes. Is it appropriate for skin lightening? Yes. Are there grapeseed oil benefits for hair care? Yes. Okay! I think you don’t need more arguments to believe how valuable for your skin could grapeseed oil be! The question here is not should you use it, but how you can take benefit from it! How to use grape seed oil? I will share with you 4 easy and quick homemade recipes, where grapeseed oil takes part. You will need 1 1/2 teacup brown sugar, 1/4 teacup grapeseed oil, 1/2 teacup almond oil. Mix all ingredients and stir well. Apply the mask to your face and neck. Leave for 15-20 minutes and rinse with lukewarm water. Store the quantity left in glassware with a lid. You will need 5-6 grapes, 1 tablespoon grapeseed oil, 1 tablespoon honey. Mix all ingredients in a blender, and apply the mixture to the face. Massage with circular movements for 2-3 minutes. Leave for 15 minutes and rinse with fresh water. Honey will help to rejuvenate the skin. You will need juice from 2-3 grapes, 1 tablespoon grapeseed oil, 1 teaspoon almond oil, 1egg yolk. Blend all ingredients, massage on the skin and leave for 15 minutes. Rinse with cool water. This mask will have a regenerative and tonic effect on the surface. You will need 1 middle-sized peeled and ground potato, 1 teaspoon grapeseed oil, 1 tablespoon milk, and oatmeal. Mix the first three ingredients and add oatmeal until not being too runny. Apply on the face and neck, and leave for 20 minutes. Rinse with cool water. You may additionally treat with face cream. Use (some of) these recipes at home, and you will feel the effect on your skin. If you want to jump on the next skin care level, you could pick professional beauty products with natural ingredients. They combine the best of both worlds: quality ingredients and professionally tested blends, which enhance the advantages of all components. Leading the whole being more significant than its parts! Are there grapeseed oil skin side effects? According to WebMD, it is considered safe, as some disorders may include a headache, itchy scalp, dizziness, and nausea. 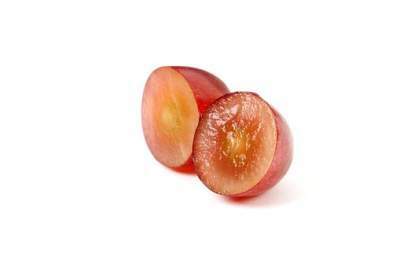 If you are allergic to grapes, you should not use grape seed extract. If you have a bleeding disorder or high blood pressure, consult with a specialist. If you take any medicines regularly, talk to your doctor before you start using grape seed extract. It could interact with drugs like blood thinners, NSAID painkillers (like aspirin, Advil, and Aleve), certain heart medicines, cancer treatments, and others. Pregnant or breastfeeding women are recommended to avoid grape seed oil. Small is big! Who would believe there is so much value in a tiny seed! Should you remember one or two messages from this text, I would suggest you the following takeaway, regarding grape seed oil: rich in linoleic acid, and vitamin E! The decision to start using grapeseed oil with either homemade recipes or professional natural formulas is a no-brainer. I would love to hear from you! Do you (plan to) use grapeseed oil? Leave me a comment, I will answer you! Wow! So many amazing benefits from grape seed oil and as you say, no side effects. I love reading articles like this when people have found natural produce to supply so many benefits rather than prescription meds. Hi Andy, agree with you! You know its hard to find attractive and useful things simultaneously. Let’s see confectionery or alcohol. They both give you and take you something. This is not the case with the grapes! It only gives you pleasure, without side effects. Love the recipes! Definitely going to try them! Grapes really are incredible and I will continue to eat them everyday till the end of my days. The antioxidant effects in them are so powerful, I’ve heard people go on nothing but grape fasts for weeks that have reversed stage 2 and 3 cancers in their body, it really is a miraculous fruit, thanks for the recipe tips! I am glad you liked the recipes and the information here! Grapes seeds are really powerful antioxidants! And I am happy to hear grapes helps with cancer! Amazing! I love this for a couple reasons, one being it’s all natural, I’m an animal advocate against animal cruelty so I’m always looking for product that isn’t tested on animals. So knowing I can make my own face masks at home is the best thing in the world to me! Second, most people, like myself have these products right at home and it would only take a few minutes to whip this up. Thanks so much for sharing, never knew so much about grapes! Thank you for the comment! Wholeheartedly agree with you that we have to support products, which are not tested on animals. This is one of the factors I respect very much regarding the natural cosmetics! I am happy you learned more info about grapes! A curious fact is grapes itself, and products with grapes are so popular, but actually many people don’t know how valuable this fruit is! Not to mention the grape seeds! Try some of the masks and see the difference!